On this year’s Bloodvein River canoe trip, Amanda and I capsized our canoe on a little rock shelf drop-off. The bow of the boat went a little too far left, into slower water, turning the boat. Consequently we ended somewhat side-on to the flow in a small recirculation. This was enough to turn the boat over and we swam. I kept hold of my paddle, as any good paddler does. In maintaining the fist of my left hand around the shaft of the paddle, though, at some stage in coming out of the boat or getting to shore, I took a chunk out of the top of my thumb knuckle. It was not issue at the time. A little blood but nothing serious. I didn’t even put a plaster on it. It quickly stopped bleeding. It was right on the crease of my knuckle, however, so over the following days, it refused to stay closed. Whether I held the paddle on my left or right, my grip on the paddle meant that I had to bend my thumb. So, the little scab cracked several times per day. 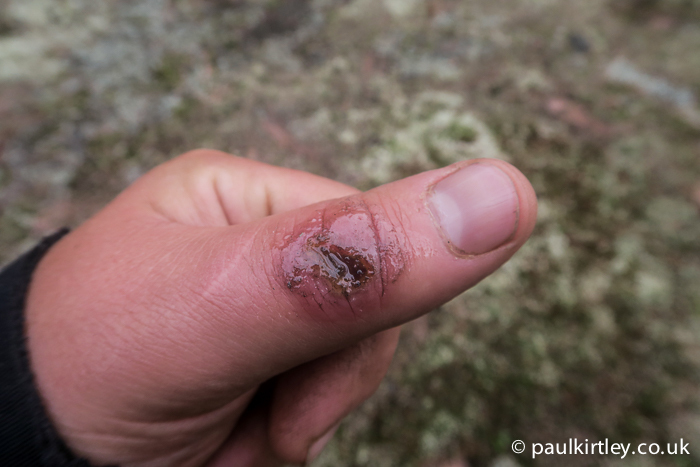 The scab got bigger and then I started catching or knocking it on things, particularly while packing or unpacking canoe packs. In the interests of keeping it protected as well as hygiene, I put a plaster and Transpore tape on it. This stopped me knocking it and kept out dirt but the more moist atmosphere under the tape also softened up the scab, which to an extent stopped it cracking but didn’t seem to help it heal. What was initially slightly more than a minor graze was turning into an significant irritation. It bothered me that the area of soreness was actually increasing. On inspection, the area around the scab was somewhat swollen and inflamed. I was concerned it was possibly infected. It was at this stage, at a camp which had a number of balsam firs on the edge of a clearing, that I thought to employ a traditional treatment. Balsam fir, Abies balsamea, is a species native to eastern North America. It occurs from Labrador westwards to Alberta and south as far as West Virginia. It has also been cultivated in Europe. 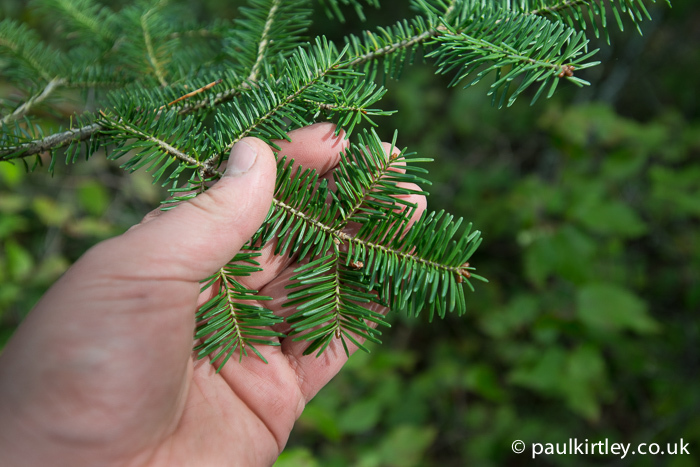 Balsam fir was one of the most used medicinal plants by eastern First Nations. In particular, the Penobscot used the resin as an antiseptic for burns, sores and wounds. The sap has both antiseptic and analgesic properties. Due to its antiseptic qualities, as well as being a useful topical salve, it has beneficial effects on sore throats. In fact the consistency of the sap is a little bit like the inside of a cough sweet such as Lockets. A tea of the green needles was also widely used for colds and coughs. In addition to the medicinal use of balsam fir for cuts, grazes and sores, there were many other traditional medicinal applications of this tree, both in isolation and combined with other ingredients. Additionally, there was an important modern scientific use of the resin to produce Canada balsam, a turpentine made from the resin and used in the preparation of microscope slides. Resin can be easily harvested in small quantities from blisters on the main trunk of small to medium sized trees. On piercing a blister the sap is quite free flowing. You don’t typically need to squeeze the blister. 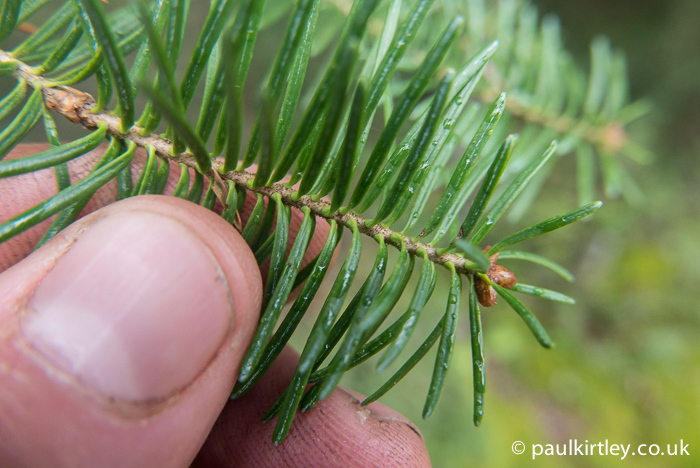 Piercing a resin blister on a balsam fir tree. Photo: Paul Kirtley. The sap is of a consistency that means it will flow downwards under the effect of gravity. It’s quite a light sap, quite liquid and free-flowing. It’s this I used on my sore thumb. And it worked a treat. Not only did it help the soreness, it stopped the skin/scab from cracking any further. It did seem to promote healing directly too. Balsam fir resin applied to my sore thumb. Photo: Paul Kirtley. 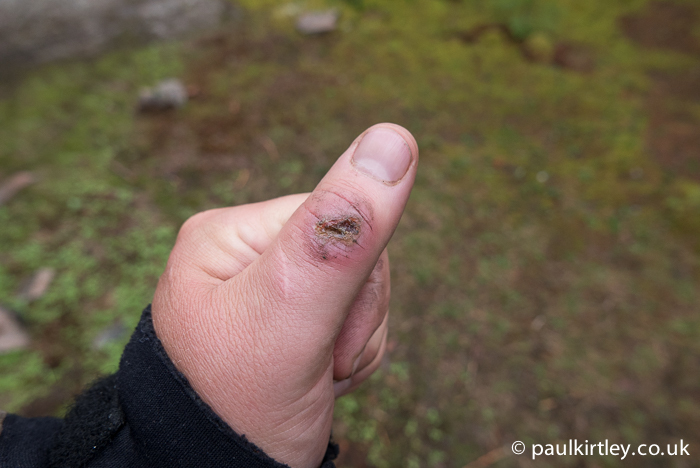 I applied balsam fir sap for a number of days and this was enough to get my thumb well under way to healing properly, all the while still on the trip. This was after it becoming gradually worse over the course of 4 or 5 days. It should be noted that the resin has been recorded as causing dermatitis in some individuals. 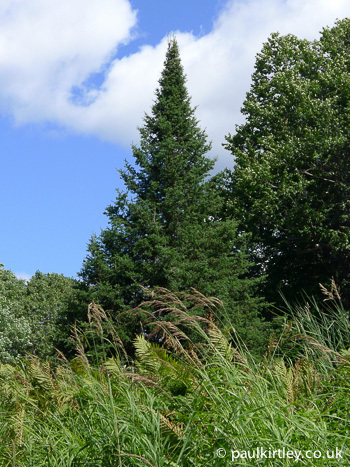 The tree is quite conical and spire-shaped (see the photo at the top of this article). It is a fir, Abies, and so shares some of the common features of this genus. 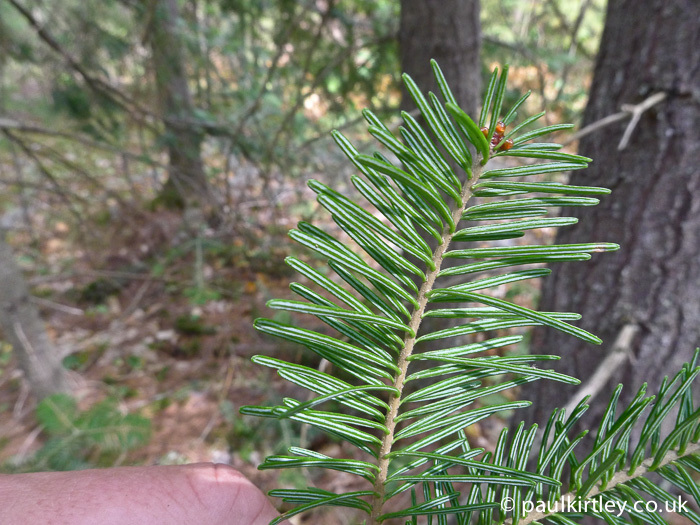 Needles emanate individually and are attached to twigs with what look like little green suction cups as opposed to a woody peg (spruces) or in a fascicle (pines). The top of the needles are glossy and green and each has a clear groove, while the undersides of the needles have two clear whitish bands of stomata. And of course, the bark is silvery grey with numerous obvious resin blisters. 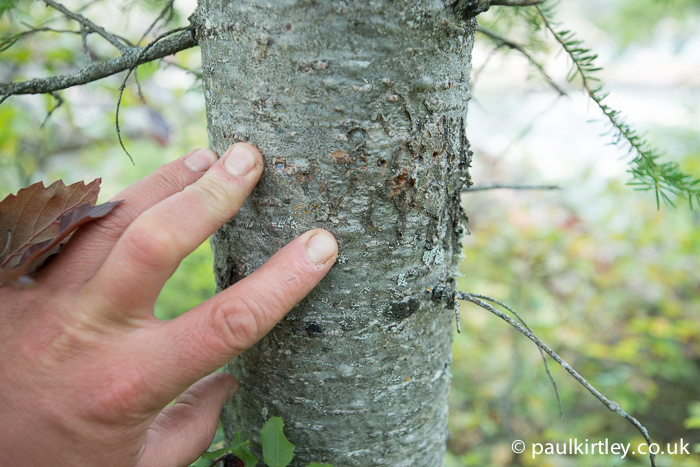 The silvery-grey bark of balsam fir, Abies balsamea, with numerous resin blisters clearly visible. Photo: Paul Kirtley. I’d always liked this fragrant, conical epitome of the Christmas tree. Unlike the spiky spruces and scraggy Jack Pines it rubs shoulders with, it has class and refinement. It’s also a veritable traditional medicine cabinet. What pleased me even more on this trip was that balsam fir sap proved to be the most effective treatment I had access to. I now appreciate this tree even more. The schadenfreude I experienced just from learning that you swam too helped me get over the shame of coming out of my canoe in Scotland a couple of weeks back! So, no shame in swimming. We capsized twice on this 14 day trip and swamped a few times too. That’s part of the process. Looking forward to paddling with you again at some point. Many of these awesome tree’s around where I live. I have collected the sap in film container’s. Your thumb was getting nasty, amazing how mother nature provide us with this natural medicine. I found other resins from other types of tree’s are great as well. Great blog post. Cheers Paul. Glad I was able to find the time to share a bit more about this tale. With regards to storage, while I did think about collecting some in a small Nalgene, in the end I didn’t need to. There were plenty of instances of balsam fir along the journey, that I didn’t need to. It’s a fairly common tree in those parts. But just for the sake of completeness, it stays quite liquid in a sealed container and seems to keep quite well (in terms of maintaining its original character). What I don’t have access to, however, is any information on how its anti-microbial or anti-inflammatory effectiveness changes over time after being removed from the tree. Paul – the lengths that you go to in order to give such good advice is commendable! To leave your boat and sacrifice your bow paddler to educate us in the use of resin is above and beyond. On a learning note – this may be a better cure than my reliance on SuperGlue for the cracks and splits I suffer constantly going from paddling to rope work. Ahhh Andy, you’ve seen through my methods!! In terms of general cracked hands, I would recommend the use of birch leaves. Collect a couple of handfuls fresh, add some warm water and mash them up a bit in your hands then give your hands a wash with them, like you would with soap. Some natural soap – saponin – will come out but the leaves also have a softening effect. They don’t soften the skin in the sense that they make them less resilient but more that they make them more pliable. Try it an let me know how you get on. Another fine article and one for the mental First Aid cupboard ! I’ve not tried a canoe trip yet but it’s on the list ! Keep up your good work we really do appreciate your time and effort and guidance. Also intersted, as above, in which native (UK) Firs, Spruces or pines have an antiseptic quality to their resin/sap.. Sorry! What I mean is which more commonly found UK Firs, Spruces and Pines? Of course, very few are actually native! Thanks for your questions. It helped instigate a whole new article. Hi Paul, brilliant article I really enjoyed the fact that you actually used the remedy rather than just discussing it. Can I ask, can the sap of young grand fir and noble fir be used in the same way? Thanks for your feedback on this article. Glad you liked it. As for Grand Fir, Abies grandis, and Noble Fir, Abies procera, I can find reports of the pitch of former being used for being applied to burns and sores, but not the latter. The records about the use of Noble fir seem to be limited to the leaves being used as a cold medicine – either smoked or as a tea. Hi Paul, enjoyable article as always. Reminded me of 3 wilderness trips I’ve done by canoe in Algonquin Park, Ontario. Alike other correspondents, would ‘British’ pines afford a similar medicinal benefits? I really like Algonquin too. Great area. Thanks for your kind words John. You are very welcome. I do my best to share useful information with like-minded people. I’m glad you appreciate what I do on this blog. That does look rather angry. I have used balsam fir resin on cuts in the past with some good results. 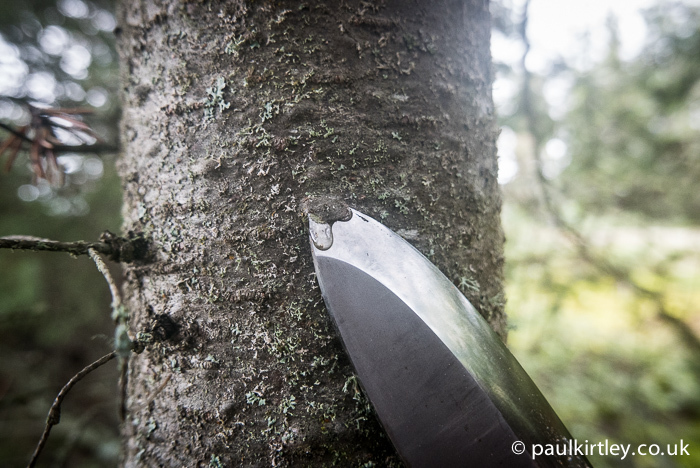 It Was only last month I was teaching some friends about the uses of this sap on a trip to the forest. They kept giving me some strange looks when I kept smelling my fingers every few seconds. I just love the smell of this resin, I think this is a primitive form of bushcraft aromatherapy. It was indeed quite sore Adrian. Interesting observation regarding the scent of these resins. Their vapours have been recorded as having beneficial effects on bronchial complaints. Very interesting. So satisfying to use a traditional cure. Is there an equivalent pine in Nothern Europe? Handy tip with the resin….fascinating …..would there be a uk equivalent? Back home- we use turmeric as an antiseptic. Always handy to know when to use it. Always nice to hear from you. Yes it was getting sore. But that was reversed pretty quickly after I began applying the balsam sap. Interesting re turmeric. I have heard/read this but never used it myself. A timely article to remind me that I will be signing up to the next plant identification course. I take it that like other coniferous saps it’s stickiness meant that it dirt would stick to the surface so a thick layer would be needed to keep it out of the cut? It’s more liquid and less sticky to start with but does dry out over time and become more tacky. So, yes it does have the potential to attract dust, dirt etc. It wasn’t a problem in reality though. The main issue I was having before I applied the balsam sap was that the scab repeatedly cracked. The sap helped prevent this, which, net-net, helped keep dirt out of the wound. Excellent article, for those of us with softer hands, if this can happen to Paul the superman then we should all be careful. I find that paddling softens my skin like sitting in the bath. I use super glue in a medical environment. But this looks like natures equivalent. Great article. One for printed published journals defiantly. keep taking the pictures of the wound healing and don’t worry I won’t tell Amanda that you deliberately flipped the boat to get a great article. Thanks for the wound care reference. Good to have in the library. Normally I use a super glue or the american tape but this seem a very natural and eco friendly alternative for cuts and so injuries. In my area there is not balsam fir but we have Pinus Sylvestris(Scotch Pine I think) and some spruces that give us a relative solid resin but I could melt it near a fire. The healing power of our trees. Love the story Paul and that we are re-discovering our old remedies. It’s the sort of thing that I do and everyone else looks askance. Almost as though you have told them to take their boots off in the woods in the UK and enjoy the re-connection with nature walking barefoot! Slows people down and stops them stomping about! Yes, there is so much good stuff out there, if only we know where to look. It’s definitely a case of re-connection. The askance looks seem to arise from the general level of disconnect… and something I’ve experienced many times. Could you use balsam ic vinegar?